Camera Ready: New David & Margaret Publicity Coordinator Julie Griffith wants to broaden the nonprofit organization's participant community. Julie Griffith, a La Verne resident, has been named publicity coordinator for David & Margaret Youth and Family Services, where she will be tasked with increasing awareness of the nonprofit organization’s mission of empowering children’s lives. 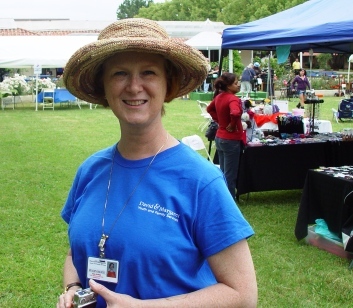 Julie comes to David & Margaret from the Almansor Center in South Pasadena and prior to that, Citrus Valley Health Partners in Covina, both nonprofits. At the Monday, May 16 City Council meeting, La Verne resident Tim Hepburn was named to the La Verne Planning Commission, filling the seat of Richard McKee who passed away unexpectedly last month. Tim’s role on the commission would begin immediately, with his first meeting being June 8, 2011 and extending until June 30, 2014. Tim has been in the electrical construction industry for 34 years, which has afforded him the opportunity to own and renovate various properties in La Verne. “I like to keep my properties in the best of shape to improve the values of our community,” he said. “I travel quite a lot and I have seen many communities that do not have the pride that we do in La Verne.” As a planning commissioner, Hepburn said he would work to provide more alternative active retirement housing and business development, with more upscale restaurants and shops in the Old Town area. Tim is also the past president of the Bonita High School Boosters Club.